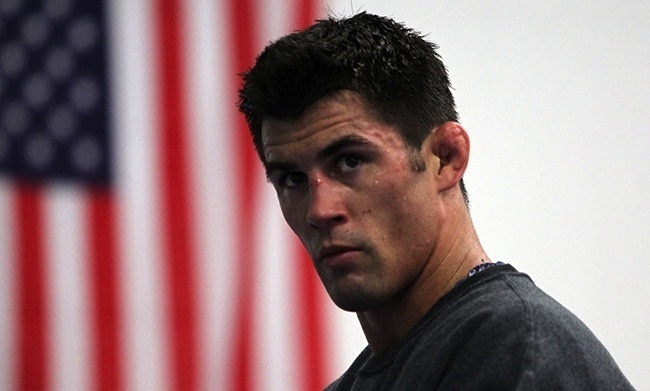 UFC Bantamweight champion Dominick Cruz and I share a birthday. March 9. Wikipedia says he was born on September 3 but he tells me he was born on March 9. I'm not sure who to believe. The reporter from Hombre, though, is smart. She knows the best way to keep an athlete at a press junket from dying of boredom is to ask questions no else asks. So she asks what his sign is. The problem is, Cruz doesn’t know. “Well, when’s your birthday?” she asks. “That’s my birthday as well,” I say. “You can’t have my birthday,” he says. The reporter from Hombre is excited. “You’re both Pisces,” she says. But Cruz doesn’t care about astrology, and he doesn’t know what it means to be a Pisces. The reporter gets out her phone, finds an astrology Web site, and starts reading out loud. “That sounds just like me,” I say, trying to be helpful. Cruz won’t budge, though. “I’m not very creative,” he says. Cruz’s skepticism is now palpable. “Oh, okay,” he says with a grin. The reporter looks back at her phone. “I don’t think I trust this source I’m getting this from,” she says. Cruz laughs, his doubts confirmed. “Now you’re gonna blame the Web site?” he says. “The source and not the stars.” Cassius couldn’t have said it better. A waitress comes over to the table. I order the Caesar Salad (for that “lean and hungry look”). Cruz orders the sesame seared ahi tuna. “How do you want that cooked?” the waitress asks. “Umm, I thought it came seared,” Cruz said. A reporter from AP sits down next to me, plops a voice recorder down in front of Cruz, and starts asking about welterweight champion Georges St-Pierre’s recent admission that he couldn’t remember what happened during a recent fight. With all the talk out there about concussions and brain damage, does what GSP said concern Cruz? The AP reporter says he wouldn’t. “Why won’t you remember this conversation?” I ask. The waitress brings our food. The reporter from Hombre, who also ordered the seared tuna, keeps looking at Cruz’s plate. She says she wishes she’d gotten it rare as well. While we’re eating, a public relations guy from the UFC brings over Cruz’s championship belt for us to see and for photographers to take pictures of. It’s huge and gold and surreal to see up close. Someone jokes that it would be a great thing to keep in your car in case you get pulled over. The surest way to get out of a ticket. “Actually,” Cruz says. “It’s 50/50. A lot of cops will bust you just because you’re a UFC fighter. I pray when I get pulled over they don’t recognize me.” He pauses. “But I don’t get pulled over." “You get busted for being a UFC fighter?” I ask, looking up from my salad. Cruz turns back to his food and I start talking to a PR woman from the Prudential Center in Newark, where Cruz’s fight with Barao will be held in February. She keeps looking at her phone. I ask her if everything’s all right. Yes, she says, she’s just busy getting things ready for the arrival that night of Disney on Ice.